The Imaginext DC Super Friends Batbot Xtreme is the ultimate toy for Batman fans. Your young Super Hero will have a blast defending Gotham from all sorts of diabolical Super-Villain attacks! At over two-feet tall, the Batbot Xtreme towers over enemies and is packed with tons of features such as extendable wings, multiple projectile launchers, a hidden Batcycle, a voice changer, and real punching fists all accessible with turn of a power disk making this a great toy for any age. Imaginext delivers the goods once again as they continue to build on their already impressive DC Super Friends lines. This time around is the Batbot Xtreme. Direct from the DC Comic series comes this towering toy that based on just size alone is pretty impressive. Coming in at just over two feet tall youngster are eye level with this immensely interactive toy. Our five year old toy tester Ian was immediately in awe of this toy even before we got it out of the box. With all of the launching abilities this robot offers coupled with the expandable wings complete with punching power you would think that would be enough but, the creators really went the extra distance with this product as you also get a launching bat cycle, an opening chest compartment complete with elevator which can transport figures in to the cockpit of the robot and, to top it all off a voice changer which allows a users voice to be transformed into that of the robot. This feature was one that Ian really loved as not only did it add to the creative play experience it provided a good amount of giggles both for him and mom and dad. 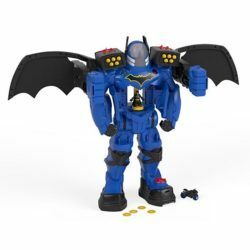 Imaginext really hit it out of the park with the Batbot Xtreme. Yes the $99 price tag might seem a bit steep at first glance but, once you really take a look at all the toys features and its rugged construction you can quickly see that this toy is one which will provide hours of fun and enjoyment for many years to come. Ian certainly put the Batbot through its paces and after a weekend of play the only negative we could find is that for smaller children it can be a bit difficult to move because of the size. This resulted in a few calls from the play room to mom and dad for a little help. Possibly the addition of a few small wheels on the bottom would enhance the play even more and make moving a little easier however, its always nice to get that call for help as my wife and I were quickly recruited in to the play. With the holidays right around the corner Imaginext’s Batbot Xtreme is a near perfect toy to add to your loved ones list this year no matter what age. As the follow up to “LEGO Batman, The Movie: DC Super Heroes Unite”, “LEGO DC Comics Super Heroes: Justice League vs Bizarro League” brings the DC Comic universe together to battle a unique set of villains called The Bizarro League. Batman has joined the newly formed Justice League as a way to keep his eye on Superman. This task seems to be complicated by Superman’s clumsy clone Bizarro whose creation of his own league of off kiltered superheroes has caused its fair share of problems however an even greater force lurking in the shadows will force the two leagues together in an effort to defeat the impeding evil. 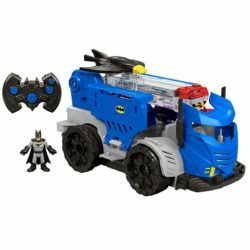 I have to start out by saying that I love the partnership between LEGO and DC Comics. Two of my favorite things growing up were LEGO’s and comics so whenever I get to enjoy the two at once especially in film form its always great fun. “LEGO DC Comics Super Heroes: Justice League vs Bizarro League” is a great follow up to the LEGO Batman film from a few years ago. Presented in stunning Blu-Ray all the colors, action and sound practically leap out of your screen as the tale of the two leagues join together to battle an evil which is threatening the world. Don’t let the idea of this film being a kids film fool you as there were plenty of times where I found myself laughing out loud at some of the dialogue between characters. I found this added to the films appeal making it a movie you can throw on and watch with the entire family. Though the film is considerably shorter than the previous LEGO/DC film (by about 27 minutes to be exact) the disc comes packed with some really cool special features such as a Bizarro featurette and a blooper reel. Also for those purchasing the Blu-Ray Combo pack you get a really cool special edition Bizarro Batman LEGO figure so even though the film is a bit shorter the special features and figure certainly help its appeal making the latest release from LEGO and DC Comics a great addition to any LEGO or comic fan’s collection. DC Comics is becoming much more relevant recently following the success of Marvels. Especially with the bunch of new films announced by DC including “Batman v Superman: Dawn of Justice”, fans are going to be looking for history of these characters in preparation for the films. This updated and expanded edition of “DC Comics: A Visual History” is a must have for any comic fan. It includes 16 new pages to cover 2010-2014 and an amazing new slipcase design along with two NEW prints packed inside. This has everything any fan would want to find out. It is detailed as hell and jam-packed with amazing information. Official Premise: Trace DC’s fascinating story: the company’s beginnings as National Allied Publications in the 1934, and its subsequent change to Detective Comics, Inc. in 1937. The book details all the major DC publishing landmarks and more, displayed clearly, month by month. 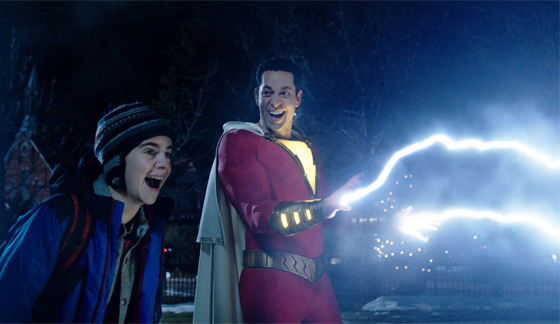 Highlighting the debuts of iconic super heroes like Superman and Batman, the geniuses that invented them, and the real-life events, like the Vietnam War, the atom bomb, and the Space Race, that shaped the atmosphere of the times, DC Comics: A Visual History follows the characters’ foray into the real world through TV series and blockbuster movies. There is a solid foreword from former president of DC Comics (2002-2009), Paul Levitz. I have to admit, even though I have been a huge Batman and Superman fan since I was a kid, I have never been too big on the rest of the universe that was surrounding them. After reading this book, I understand that it is quite massive and really exciting to see what is set to come in the future. DK did an amazing job on this release, it is a literally a marvel (no pun intended) to look at and is so detailed, colorful and there is not an inch wasted throughout as it is filled with amazing images and facts. So, here we are in 2014. Hopefully, we’ll see more of the awesomeness that we saw in 2013’s comic books, as some seriously cool stuff came out. However, there is always the other side to things; some companies made some horrible errors and some obvious ‘money grabs’. Let’s take a gander, shall we? Oh DC…it was going so right, where did it go wrong?? Last year saw the reboot of DC with the New 52, which was pretty damn awesome. As with most reboots, all the industry’s best writers and artists were invited to the party, including Jim Lee re-envisioning the “Justice League,” which was hands down one of the most fun books to read at the time (and I never really liked the “Justice League”). All of the Bat-Books that came out were so good that I actually didn’t mind having to read multiple books about the same character (something that started in the 80s & exploded in the 90s and has been a major annoyance for me ever since…at one time I remember there being something like seven or eight “Spider-Man” books and the same number of X-Books, all coming out at the same time…ugh, there’s only so much story people). I was even getting excited about “Action Comics” and “Supergirl” for a few issues, and I absolutely hate the “Superman” family of books!! But alas, it all came crashing down. First, they did the unthinkable. They turned three or four of their most hidden gems, the Coup-de-Villes at the bottom of the Cracker Jacks box, over to Rob Liefeld. WHAT??? ARE YOU KIDDING ME?? DON’T YOU REMEMBER WHO THIS GUY IS?? So, what were once gritty, hard-hitting titles, like “Deathstroke,” “Hawk & Dove,” “Hawkman” and “Grifter,” which were all fun reads with outstanding art, became Liefeld strokefests and turned to utter crap, just like everything he’s ever done!! History repeats itself…duh! Then they pulled some of their better writers and artists off of the minor books, such as “Voodoo,” “Stormwatch” and “Captain Atom,” all higher-brow reading with compelling stories that actually made you think about life and existence and such, because they were minor books (even though they were becoming majorly awesome because of those creators) to play shuffle around with the bigger books. Cliché alert…if it ain’t broke…!!! Then the “Zero Year” debacle happened, forcing all of the Bat-books to tell the story that the editor wanted told. By this point, there were so many crossovers happening that creators were walking away from the books that they once made incredible because they were being restrained by editorial whims. Once again…REALLY DC?? REALLY?? HIRE BOB HARRAS, THE GUY WHO SINGLE HANDEDLY WRECKED THE X-UNIVERSE IN THE 90S??? Again, DC…don’t you remember these people and what they did. Why hire them when you were doing just fine?!?! It wasn’t all bad though!! Thankfully, we did see some incredible stuff come out of DC. Scott Snider’s “Batman” stories continue to enthrall readers. Batgirl was truly wonderful as she became a renegade running from her own father, Commissioner Gordon. “Batwoman” was awe-inspiring with beautiful illustrations by JH Williams III and killer stories about supernatural villains and dark family secrets. “Swamp Thing,” “Aquaman” and “Earth 2” continue to be the most consistent and well-written stories with killer art and brilliant subtle humor. To come full circle, DC did produce perhaps the best comic story I’ve read in years, “Injustice: Gods Among Us.” Just simply & truly amazing. Superman goes from a helpless lovesick fool who has no idea how to deal with the Joker (who tricks him into then killing Lois Lane) to a killer and militant totalitarian leader of the world, and Wonder Woman couldn’t be happier. In her own words, “I was waiting for this.” Of course, Batman is leading the resistance. With twists and turns that rock the entire DC universe, including a Harley Quinn who acquires powers, this book is just simply brilliant!! Next time, the ‘Independents’ and how they are currently ruling the comic industry. I will never forget the first time that I saw “Robot Chicken”. I can still watch the first episode and belly-laugh throughout. This Emmy Award winning show has come so far over the last 8 years and 120 episodes. In this latest special no superhero is spared and no one is safe. If you are a fan of this show then this is a no-brainer. But if you have seen this special on TV and wondering why would you purchase this Blu-ray for only a 23 minute episode…well the answer is to get the additional 2+ hours of bonus content! It is easily makes this Blu-ray worth the purchase! Official Premise: The special, which boasts an all-star cast as well as characters Robot Chicken fans have grown to love, provides a unique take on some of the most iconic superheroes from the DC Comics universe – along with others whose powers can’t really be called “super.” So what happens when Robot Chicken and DC Comics collide — who will survive with their super-dignities intact? NOBODY! In Robot Chicken’s hands, Superman, Batman, Wonder Woman and even Mr. Banjo could end up dead or naked or both or neither. Like most “Robot Chicken” specials, this one features an all-star cast including series co-creator and executive producer Seth Green as Batman, Robin and the put-upon Aquaman; Neil Patrick Harris as Two-Face; Alfred Molina as Lex Luthor; Nathan Fillion as the Green Lantern; Megan Fox as Lois Lane; series and special writer/voice talent Breckin Meyer as Superman, plus Abe Benrubi, Alex Borstein, Clare Grant, Tara Strong, series co-creator and executive producer Matthew Senreich, series co-head writer/co-executive producer Tom Root, series director Zeb Wells and Kevin Shinick as co-producer, writer and narrator. This special goes all out and it shows! Like I said this release really shines with its special features. There are two hours of bonus content created by the special’s producers. We get tons of great deleted sketches and outtakes. There are both writers and actors commentary tracks for the special. ”The Making of Robot Chicken DC Comics Special” is a great behind-the-scenes look. “Robot Chicken DC Comics Special’s Aquaman Origin Story” is a fun look at the most hated DC character. “DC Entertainment Tour” is a cool look into the offices. Lastly there are “Stoopid Alter Egos” and “5.2 Questions” to the creators. LEGO is one really smart company. They not only have tons of great franchises like “Harry Potter”, “The Lord of the Rings” and “Star Wars” but they also have DC Comics on their side. The LEGO Batman series is one of my favorites. In fact, I have been playing the new “LEGO Batman: DC Super Heroes” on the iPhone quite a bit recently. So I am beyond excited for a full-length feature film. I love what LEGO has done with the “Star Wars” shorts but they are just that…short. This epic feature-film is very well made, packs a great voice cast and is alsovery funny. LEGO should be making these films for every franchise they support. They are great a real blast, clever and pack some great replay value. This is a must watch for all kids (and big kids) who love comics and superheroes! The voice cast including Clancy Brown (“SpongeBob SquarePants” ) leads the pack with voicing Lex Luthor. Troy Baker (“Batman: Arkham City”) pull double duty with voicing Batman and Two-Face. Travis Willingham voices Superman (“Avengers Assemble”, “The Super Hero Squad Show”). Rob Paulsen (“Animaniacs”), one of my favorite voice actors, is a laugh riot as Riddler. Christopher Corey Smith does a great job as The Joker (“Mortal Kombat vs. DC Universe”) and lastly gotta give props to Charlie Schlatter (“Diagnosis Murder”) for giving Robin some great life! Official Premise: DC Comics’ greatest superheroes and their arch nemeses face-off in a hilarious, action-packed battle in LEGO Batman: The Movie. Based on the popular video game series, the full-length TT Animation feature finds Lex Luthor taking jealousy to new heights when fellow billionaire Bruce Wayne wins the Man of the Year Award. To top Wayne’s accomplishment, Lex begins a campaign for President. And to create the atmosphere for his type of fear-based politics, he recruits the Joker to perfect a Black LEGO Destructor Ray. While wreaking havoc on Gotham, Lex successfully destroys Batman’s technology, forcing the Caped Crusader to reluctantly turn to Superman for help. Warner Home Video has delivered a fantastic release here. This combo pack includes a Blu-ray + DVD + UltraViolet Digital Copy, which I will be redeeming and revisiting quite often. Did I mention this release also comes with an exclusive LEGO Clark Kent/Superman Minifigure. I mean I would purchase just for that to be honest. The 1080p transfer looks stunning and very clear. The film is quite colorful and it literally jumps off the screen. The DTS-HD Master Audio Track works so well with the film’s action and fantastic scores. Once you hear that classic “Batman” theme you cannot help but just take a trip down memory lane. The special features are quite impressive. “Building Batman” puts us together with kids and master LEGO builder Garrett Barati about how they can make their own Batman mini-movie with LEGO’s. “Lego Batman Jumps Into Action” is Garrett Barati’s teaser used for “LEGO Super Heroes” and shows what can be done with stop-motion animation. “LEGO/DC Universe Super Heroes Video Contest Winners” shows us the short films from five of the winning entries. Lastly there are bonus DC episodes including “Triumvirate of Terror” and “Scorn of the Star Sapphire” from “Batman: The Brave and the Bold”, and “Overdrive” from “Teen Titans”. Mimoco, creator of the MIMOBOT® line of designer USB flash drives and MIMOMICRO® card readers, and Warner Bros. Consumer Products on behalf of DC Entertainment, the world’s largest publisher of comic books, introduce the Batman™ “The Dark Knight Rises” Edition, Superman, and The Flash series of MIMOBOT designer USB flash drives. Joining the original Batman and Green Lantern waves of MIMOBOT flash drives, these essential super hero characters are available in up to 64GB capacities and come preloaded with bonus Mimory™ and mimoDesk™ suites of screensavers, avatars, and wallpapers. Media Mikes would like to giveaway one of each of these amazing DC Comics MIMOBOT® USB Flash Drives. If you would like to win one of these great prizes, please leave us a comment below or send us an email and let us know your favorite DC character. This giveaway will be open until Friday July 6th at Noon, Eastern Time and is only open to residents of the United States. Only one entry per person, per household; all other entries will be considered invalid. Once the giveaway ends, Media Mikes will randomly pick out four winners and alert the winners via email. Batman™ (“The Dark Knight Rises” Edition) X MIMOBOT® features a brand-new design inspired by the Christopher Nolan-helmed trilogy of films. Batman™ (“The Dark Knight Rises” Edition) X MIMOBOT allows you to safely transport your documents, pictures, music and more, in style. Superman™ X MIMOBOT® – The Man of Steel is now the ultimate in transportable data! Don’t be Clark Kent! Take off those glasses, tear open your shirt, and save the day with all of your music, pics, and documents at the tip of your fingers. All of it will be packaged as one of the most iconic super heroes of all time, complete with red cape, S-shield, and swooping hair. When you need your digital data, Superman MIMOBOT will be there to save the day!